Two-sided (C2S) cast-coated paper makes beautiful gift cards and other cards where it is desirable to have a glossy finish on both sides. This 10 pt card has a 92 brightness and an ultra smooth surface and prints beautifully in both color and black & white lasers. It weighs in at 237 g/m2. Rippedsheets.com can convert this material with perforations and folding scores. Microperfing and/or scoring twice across (AC) or twice down (DN) included in the price without a die charge. Prices are per sheet. For more complex needs, please see Microperfing/scoring die costs. 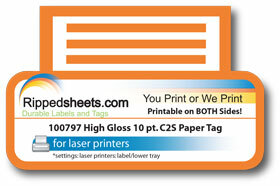 This material meets US Postal Service Automation Design Standards for postcard minimum weight ( 7 pt. (0.007″)).